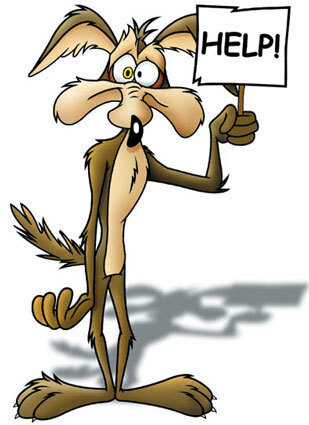 Wile E. Coyote, idiotprufs legend. Idiot: a dolt, a dullard, a mentally deficient person, the guy who drives down the road with his seatbelt hanging from the door making sparks on the road. idiotpruf: Any lesson learned as the direct result of an overt act of idiocy, or the observation of an overt act of idiocy. An act that proves that you are in fact an idiot. Example: If you don’t want to be mocked by other motorist; don’t drive down the road with your seatbelt hanging from the door making sparks on the road. I’ve been compiling a list of idiotprufs based on my own acts of idiocy, from observing the acts of idiocy of others, and from stories I’ve been told. Regardless of how far your garden hose sprays; you’re still too close to the bees nest. Being asked,”and what did we learn today,” as bee stingers are being pulled from your face, is the epitome of adding insult to injury. Don’t try to remove a hornet’s nest from your garage by burning it out; you will wind up with half a garage, and a hornet’s nest. You never want to find out the quantifying measure for the phrase, mad as a hornet. Firemen like to say snide things as they hose down the side of your garage. Regardless of how sturdy an umbrella seems, it is not an adequate substitute for a parachute. Never try to pound a nail into something above your head using the dull side of a hatchet; misusing a hatchet in this way might cause its head to pop off. A hatchet head only has to fall a foot or two to cause a considerable amount of damage to a human skull. Head wounds bleed a lot. If you don’t want to be bitten by the big brown snake; don’t poke at it with a stick. Snake bites bleed a lot. The average household vacuum cleaner is not designed to pick up paperclips; attempting to do so may cause the average household vacuum cleaner to explode and catch on fire. A burning vacuum cleaner may also ignite the carpet. A burning carpet will set off every smoke alarm in the house. Melting Play-Doh in a frying pan seems like a brilliant scientific experiment to a child. That child’s mother: not so much. Burning Play-Doh will set off a smoke alarm. One errant sock in the laundry can turn an entire load of whites into a load of pinks. “Hey, you know that pink sweatshirt you love so much?” is not a good way to tell your roommate that you’ve turned the laundry pink. A healthy dose of bleach will turn anything white. A healthy dose of bleach will also give you a pile of really white rags. “Hey, you know that really white sweatshirt full of holes you love so much?” is not a good way to tell your roommate that you’ve used too much bleach on the laundry. A car that has been run out of motor oil, is less of automobile, and more of giant metal traffic clogger. Asking your girlfriend, whose car has been run out of motor oil, if she knows why it’s called a dipstick, is a really bad idea. When your girlfriend asks, “how stupid do you think I am?” she is not looking for a quantifying answer. The phrase “some day we’ll look back at this and laugh” doesn’t always apply. Seriously, I literally have hundreds of these. I’m finding that everybody has some, do you? 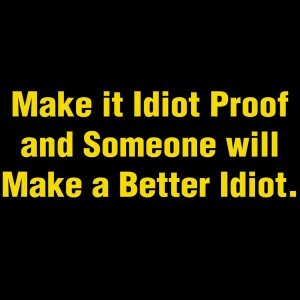 The actual word idiot-proof is a misnomer; there is nothing a true idiot can’t screw-up when given the chance.